Well, actually this problem occurs not only at resizing but every time when stopping the vm instance and starting it again without any changes. Thanks for the detailed screenshots! I was able to get your Bitnami Support tool report getting the code from the images, I cannot see anything weird there. Instead in the last screenshot, it seems that there is another server listening on port 80 on your machine. Could you please attach the output of the following commands? I have now discovered that the problem only occurs after I resolved the ssl certificate. 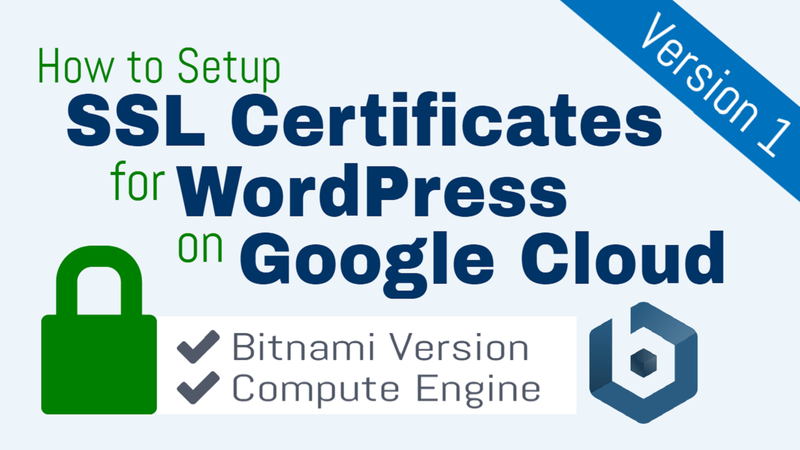 SSL Certificate setup for WordPress on Google Cloud using free Let's Encrypt SSL Certificates that are configured to automatically renew themselves. We are glad that you were able to fix the issue. No, no ! I couldn't fix the issue at all! It's just an observation that it only occurs if there's an ssl certificate on the wordpress site which is a very necessary feature so my issue is not resolved. As you can see you have another Apache running (please note that the one included on the Bitnami stack is under /opt/bitnami/apache2/ instead of /usr/sbin). That's why you're unable to start it using the ctlscript.sh command. Could you please stop it and restart the services by running the commands below? Hello, I have run this command but it doesn't change anytinhg. In order to debug the issue, could you please run the following commands and share the output with us? As you can see, the non-Bitnami Apache continues running after trying to kill the process, could you please share with us the list of running services so we can stop the service properly? If apache or httpd is on the list, could you please stop it by running this command? Hello, now I'm a but confused, I can't totally understand the point of the problem. You installed it in the past using the apt-get commands and now it's using the 80 port so the Bitnami's Apache can't use that port and you can't access your site. I still can't access my site. Here are the outputs of the commands you recommended. Based on the information you posted here, the Bitnami's Apache could be started after stopping the system's one. Can't you access the application now? Did you receive any error message? I just accessed https://www.vasinetbolt.hu/ and it works fine. I always follow these steps and always happening the same. The wordpress installation works perfectly until I try to restart or resize the VM instance. We have a section in our documentation that explains how to configure a Let's Encrypt certificate in a Bitnami image. We maintain that documentation and it's been already tested by us and lots of users. Could you please read it and let us know any questions you may have?